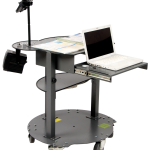 The KONGcart 2005 secures a laptop on a tractable drawer and provides a dedicated work surface at the same time. 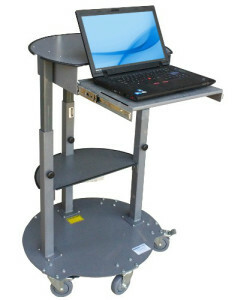 This handy industrial cart is height adjustable from 29″-42″ and comes with a universal security plate that attaches in any of three positions on the back of the top work surface to offer secure mounting of IT devices such as printers, scanners, etc. 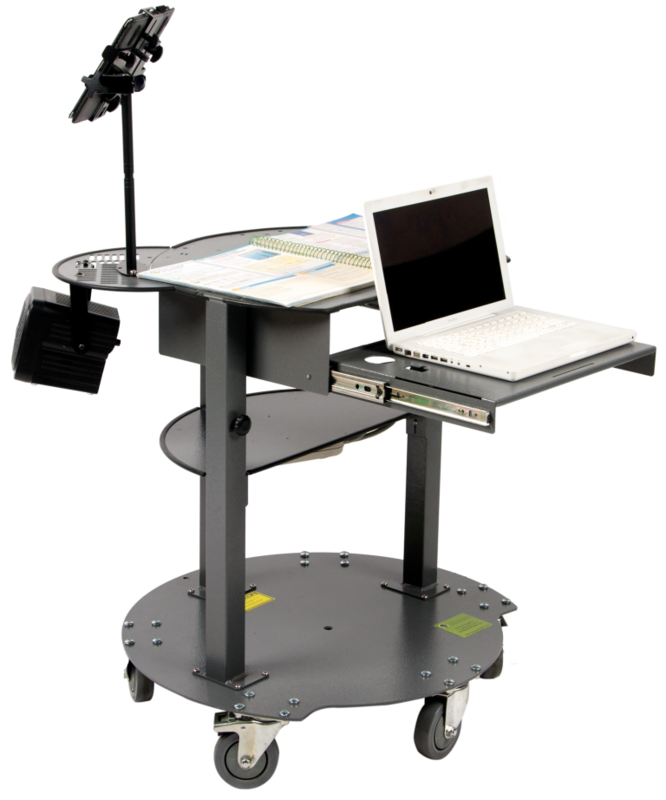 The innovative circular footprint allows the cart to move around any workplace with ease. 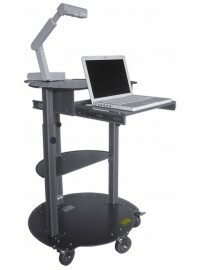 The 1/4 steel base plate provides ample stability. 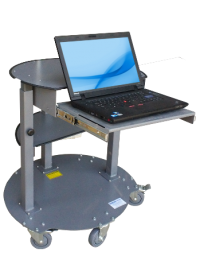 The Crescent Plate features a slotted design that makes it possible to lock down most any IT device with threaded inserts. 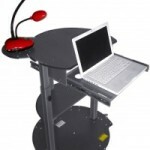 Custom tamper-proof screws and allen wrench provided. 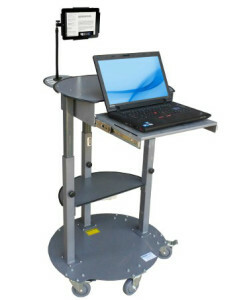 Also available is a Security Disk Kit (Accessories sku 8130) that enables IT devices without inserts to be mounted. 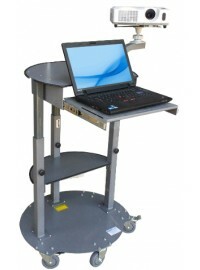 The Crescent Plate can be installed on the left, right or center of the cart. 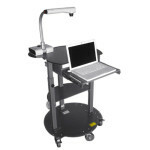 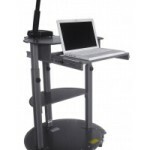 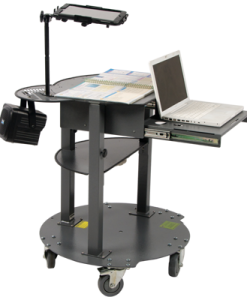 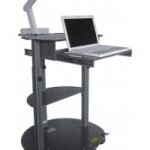 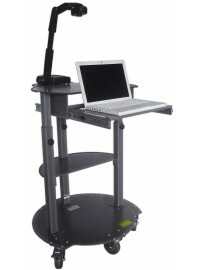 The KONGcart 2005 was designed to be used either sitting or standing. 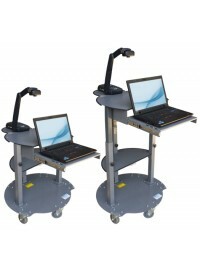 Two hydraulic pistons, built into the left & right side support posts allow the KONGcart to adjust with ease from 29″ to 42″, with equipment attached. 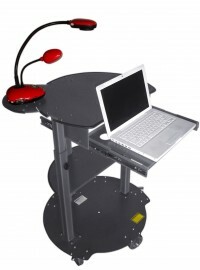 Three knobs firmly secure the KONGcart at the desired height. An adjustable ball joint pivot allows the projector to be adjusted for the perfect shooting angle, while remaining within easy reach. 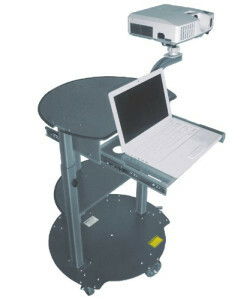 The projector mount is also independently height adjustable to reduce the amount of obstruction to the viewing audience. 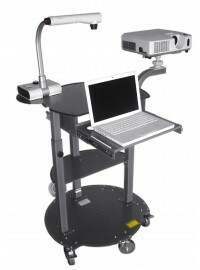 The KONGcart SKU 2095 includes the Projector Mount and Crescent Plate. 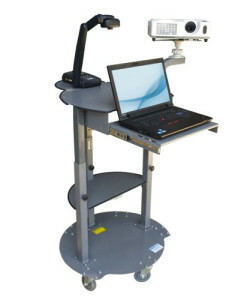 Use virtually any tablet device as a document camera with this height adjustable and versatile mount. 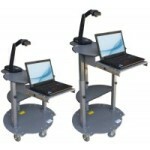 Mounts to KONGcart.